Yesterday I identified some great trade opportunities in some cryptocurrencies that were lagging in relation to their peers. 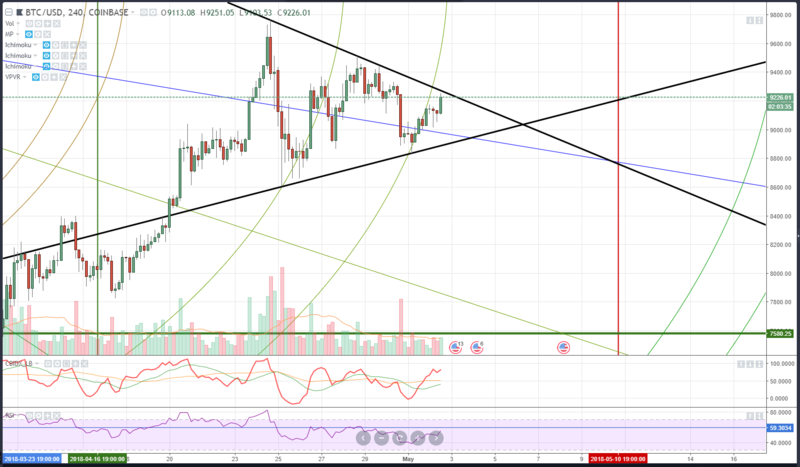 We’re going to review those, but first, we need to see what Bitcoin is up to and how close it is to breaking out of this triangle. This tight range we are experiencing is a normal and frequent market pattern that shows up after any bull or bear run. It’s technically a wedge/triangle but it behaves more like a bullish flag or bullish pennant. A ping-ponging of price off the new lower highs and higher lows creates a spring-like action that eventually causes a big move. Being that we are now outside of this most recent arc, we should see price move more steadily up instead of suffering inside the arc. We have also maintained a level above the 1×5 Gann angle (blue diagonal line). While the 4-hour chart here does show a bias for some selling, the daily chart is supportive for buying. The next wave up is right in front of us.